MAE-affiliated heat energy storage startup Element 16 Technologies won a $1,500,000 grant from the California Energy Commission to build and install a pilot plant. The Element 16 pilot plant will provide electricity, heating, and cooling on demand to a commercial facility in Los Angeles, with an energy storage capacity of 540 kWh (~10 Tesla Model 3’s but at a fraction of the cost). Element 16 (www.e16tech.com), founded by Parker Wells (MAE M.S. 2017) and MAE Associate Professor Richard Wirz in April 2016, uses technology based on a breakthrough in heat energy storage, which uses a molten sulfur mixture to replace molten salts and thermal oils. 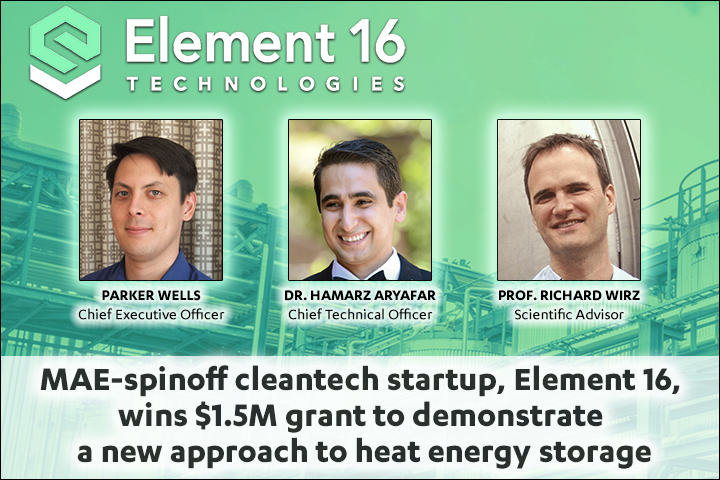 After winning the Transformational Idea Award at the Caltech FLOW competition, Element 16 attracted the attention of Dr. Hamarz Aryafar (UCLA MAE Ph.D. 2008, advisor Professor Pirouz Kavehpour) who came on board as Chief Technology Officer in late 2016. Dr. Aryafar has been a professor at Cal Poly Pomona and post-doctoral scholar at UCLA. As a postdoc with Professor Adrienne Lavine, Aryafar led the $1M+ demonstration effort for the DOE solar thermochemical energy storage project. Wells obtained his graduate degree in Professor Wirz’s research group, returning to mechanical engineering after he spent three years as co-founder and CEO of Overhead.fm, a successful music streaming service for retail spaces. So what is the breakthrough and where did it come from? Starting in 2011, Professor Wirz’s Energy Innovation Lab (www.wirz.seas.ucla.edu/energy), in partnership with NASA JPL, developed a supercritical naphthalene heat energy storage system with support from the Department of Energy’s Advanced Research Projects Agency-Energy (ARPA-E). Though the technology was demonstrated successfully, storage options such as naphthalene are not sufficiently stable for the desired temperature range and it became clear that the costs associated with the containment of supercritical fluids are prohibitive. As a result, Professor Wirz launched a new effort in partnership with UCLA Chemistry Professor Garcia-Garibay (now Dean of UCLA Physical Sciences) to find a robust and low-cost heat storage medium that is not supercritical at the temperatures for heat energy applications. They explored the properties of thousands of chemicals, which lead to the breakthrough consideration of using a molten sulfur-based medium due to its surprisingly attractive heat energy properties. Sulfur is also very inexpensive since it is an abundant waste product for many industries and benign for heat energy storage systems. Ultimately, this innovation led to a follow-on award from ARPA-E and nearly $2M in funding from the California Energy Commission and Southern California Gas. Sulfur, the 16th element in the periodic table, is the central component of Element 16’s energy storage device. The research at UCLA has been focused on developing a promising heat energy storage system for concentrated solar power, but Wells and the team recognized its potential to transform the cogeneration market. Cogeneration, also known as combined heat and power, produces 12% of the electricity in the US, which is more than solar, wind, and geothermal combined. Cogeneration plants are highly efficient power plants co-located with industrial and commercial facilities (and universities like UCLA). The exhaust heat from electricity generating engines and turbines provide valuable process heat, hot water, and chilled water to the nearby facility. The Element 16 team realized that the breakthrough for the solar industry could be used to very cheaply and compactly store heat from the cogeneration plants, so that the usage of electricity and heat didn’t need to occur at the same time. This will greatly reduce the amount of wasted heat in cogeneration plants, increasing overall efficiency and reducing carbon footprint. The DOE’s Advanced Manufacturing office also named this idea “one of the Most Promising R&D pathways” in a report for Grid Modernization and Distributed Energy Resources”. Element 16 has also worked with UCLA’s Technology Development Group to gain exclusive rights to the patents developed at UCLA, including patent applications by Wirz and Wells.